Wargroove is a fantastic game that borrows heavily from the Advance Wars milieu, filling the void that series’ absence has left behind in fans’ hearts (like mine). But for as similar as Chucklefish’s latest game might hew to its inspiration, it makes a number of smart, significant changes that are mostly for the better, giving players more to think about when making their next move. Here are the biggest ways the two games’ battles differ, with accompanying tips on how to use them to your advantage. For a deep dive on what else Wargroove has to offer that Advance Wars doesn’t, check out or episode of New Gameplay Today. By far the biggest, most nuanced change Wargroove makes to its inspiration’s gameplay are critical hits. While the name “critical hit” can imply a degree of randomness, it’s anything but: Essentially, they allow you to squeeze extra damage out of every unit (save for passive transport units) if you move them in the right place at the right time. Regular soldiers are stronger when attacking near their commander, the adorable little battlepups are extra vicious if the unit they’re attacking is next to another allied doggo, and dragons deal extra when attack units on open roads. This changes how you approach encounters dramatically, and you should consider whether you can pull off a critical hit with every move, since it can mean the difference between having to use two battlepups to defeat a soldier or just one. 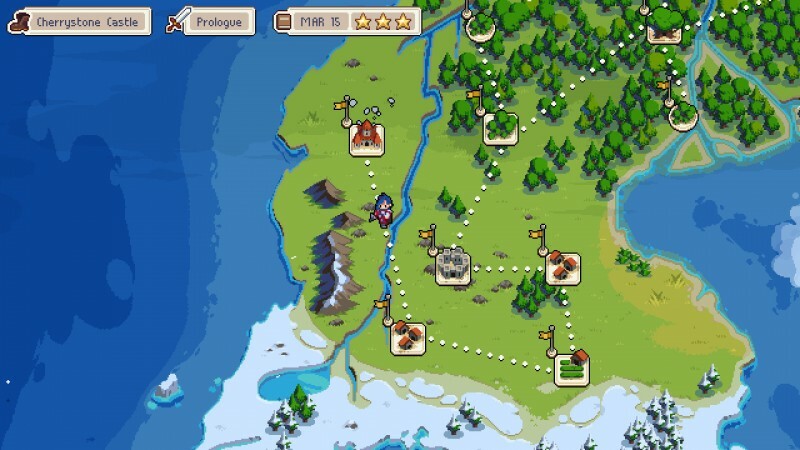 Positioning, unit order, and more all become more important factors thanks to critical hits, making every move crucial in Wargroove, but maintaining the simple tactics gameplay fans may be coming to the game for. Commanders taking charge on the battlefield isn’t unique to Wargroove (Advance Wars: Days of Ruin did this as well), but how they work in Wargroove is completely different, mostly toning them down in effectiveness. Commanders are more powerful renditions of soldiers, beating out any other ground unit in a one-on-one battle (they can’t attack air or naval units). Their powers are also very different. They don’t have zones that power up nearby units automatically. Their super abilities aren’t universal, either; they’re limited to a small area near them. That doesn’t make them useless, however, as Mercia’s healing aura or Nuru’s ability to summon any unit next to here are huge. Commanders can help win games (since they can take a beating from multiple units and still come out on top), but don’t expect your leader’s abilities to turn a losing fight on a dime. In Advance Wars, capturing a city was pretty simple. You’d walk into it with infantry, begin capturing it over two turns (with a little animation of your soldier literally stomping it with both feet), and then it was yours; same with enemy-occupied ones. That’s not the case in Wargroove. You can’t occupy the same space as a building in Wargroove, which leads to some interesting changes. For one, capturing villages is quicker, since units only need to be next to a unit, effectively saving them one movement space. Neutral cities are also captured in one turn, which means you don’t have invest as heavily in infantry early on if you want to earn a steady flow of income early on. The biggest change, however, comes as you start making your way to your opponent’s side of the map. Enemy villages fight back when you try to capture them, dealing marginal but meaningful damage to the units that try to to take them over. You can’t really send weakened units to capture villages, and even sending fully-armed ones can be risky if enemies are nearby. To compensate, any unit can attack a village, which means dragons, harpies, and any other unit that can attack land units can help capture a village. Archers and trebuchets are particularly great for this, since they can soften up villages from afar before you capture them. Also remember that knights and pikemen are far more effective at capturing enemy cities than foot soldiers, who are better left to defend their allies after capturing neutral ones. When you do capture a village (neutral or allied), you’ll notice it has a health meter. Villages start with half the health of the unit that captured them, and heal up slowly over time. This lets you know how strong (or weak) a village is when it comes to defending itself, but also factors into how it helps your own unit. In Advance Wars, any unit standing inside a city was slowly healed at, though it cost you funds proportional to that unit’s worth. Healing units with villages also costs you in Wargroove, but a village’s health also factors in, as a village loses health whenever it heals a unit. To compensate, villages can heal multiple units in a turn as if they have the health to do so, as long as you can move a unit and choose to top it off. That’s another, smaller, change by the way – units near villages don’t heal automatically, so you don’t spend gold healing units you don’t plan to keep using. Finally, you can deploy created from a barracks on any tile surrounding it instead of on top of the same tile, making it harder to block off counterattacks when making a ploy for your opponent’s base. If you had two infantry with five health each, Advance Wars let you “fuse” the two into one full-health unit. This isn’t the case in Wargroove, so you’ll have to work around it by either healing both of those units separately, or starting thinking of them as living shields to protect your stronger units from your opponents’. This might sound like a small change, but it can have huge ramifications when it comes to maintaining offensive pressure on the front lines (especially near chokepoints), as a 10-health knight is far more effective than two five-health ones. One way Advance Wars keeps some of its stronger units in check is by limiting their ammo and fuel counts. In theory, this means tanks and bombers would have to retreat to cities, or be re-fueled by APCs, to keep up their offense. In practice, this meant APCs were overworked, responsible for both transporting infantry and maintaining the front line. Wargroove removes this aspect entirely. Knights never tire of mowing down infantry and battlepups (those monsters! ), and dragons never run out of fire breath. This makes an army full of them harder to deal with, but also means trebuchets and ballistae are more crucial than ever in dealing with them. In Advance Wars, anti-air vehicles and fighter jets were situational, since they were mostly meant to rule the skies (though AA guns could mow down infantry units with ease). If you ignored those units in Advance Wars, don’t sleep on their equivalents in Wargroove. Alchemists (AA guns) are not only great for dealing with harpies and dragons (since no other ground units can attack those), but also have the ability to top off any units in a small area by two health for 300 gold. It’s best to use this ability on high-cost units like golems and dragons, since that 300 gold can save you their high reinforcement cost at villages (not to mention the turns it could take to retreat to one). Witches (fighter jets), meanwhile, can cast a hex for 200 gold, damaging all units in a medium-sized area by 1. It may not sound like much, but this again can be invaluable when faced with an number of high-value targets, or for softening up a chokepoint when used in combination with Ragna’s commander power. Alchemists and especially Witches might be more situational than most units, but their abilities help keep them relevant throughout the battle. Remember to use them in a pinch. If you’ve played a lot of Advance Wars, you probably won’t be used to archers (the equivalent of artillery) and warships (battleships) being able to move and fire on the same turn. While Trebuchets (rockets) and ballistae (missiles) can’t do this, keeping this change in mind is a big deal, especially since warships can more quickly decimate land units if they happen to be near water. Also keep in mind archers land critical hits if they don’t move before they fire, so there’s a big benefit to using them like artillery. Advance Wars had a couple of weather effects that altered movement and fuel usage, and while some commanding officers thrived under those conditions, it most made everything more of a pain. That’s probably why you don’t see weather effects in Wargroove campaign much, but they’re still in there, and they can affect battles in arcade and multiplayer. Besides Fog of War, (which impedes your sightlines) there are only two weather conditions to keep track of in Wargoove: heavy winds and severe weather, which manifests different on different maps as a rain, snow, or sandstorm depending on the map. Heavy winds actually help units, letting ground units walk an extra space, naval units two steps, and letting air units deal 20 percent more damage. Severe weather does the opposite, hampering units in the same, but inverse ways (ground units have their movement range reduced by one, for example). Keep this in mind when playing those other modes. While most of Wargroove’s units map neatly to a counterpart from the first Advance Wars, Mermen are the one exception. They can move on land and water (though they’re much more nimble at sea), have a small ranged attack, and can capture villages. They’re not the most powerful unit, but they are versatile on naval maps, and can come in handy under the right conditions. They’re also very cute. This is a fairly obscure detail relative to the others on this list, but knowing it could win you a match. If a ship is ambushed while under a bridge when fog of war is on, it dies automatically. I’m still trying to work out the reasoning behind this change, but it’s an important detail to keep in mind if you want to keep your precious sea turtles alive.